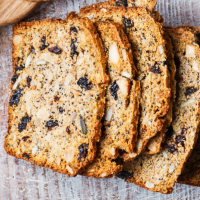 Full of flavour, these are a cross between melba toast and savoury biscotti. 1 Preheat the oven to 170˚C, gas mark 3, and grease and line the base and ends of a 900g (2lb) loaf tin with a strip of baking parchment. Roast the almonds on a baking tray for 7-10 minutes, until pale golden; cool, then chop roughly. 2 Put the flours, baking powder and bicarbonate of soda in a large mixing bowl with a pinch of salt and pepper. Mix in the sugar, almonds, cherries and seeds. In a jug, mix the oil, buttermilk and honey; mix into the dry ingredients, then knead the dough very lightly on a well-floured surface to just bring it together, until smooth. 3 Pat the dough to a rectangle slightly smaller than the tin and place inside; press into the corners. Bake on the middle shelf for about 30-35 minutes, until risen and golden. Remove and leave in the tin for 5 minutes, then turn onto a wire rack to cool completely (about 4 hours). 4 Once the loaf is cool, preheat the oven to 150˚C, gas mark 2. Using a serrated bread knife, cut 30-40 thin slices – no thicker than 0.4cm – and spread over parchment- lined baking trays. Bake in batches for about 10-15 minutes, on the middle shelf, until crisp. Cool the crackers on wire racks. FYI: The crackers can be stored in an airtight container for up to 1 week.